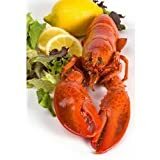 Lobster is a sweet meat, and tastes wonderful simply boiled in salt water and served with melted butter, mayonnaise, or lemon juice. It is also very easy to prepare. For best results, always use the freshest (preferably live) lobster. Cook and eat them on the day that you buy them. 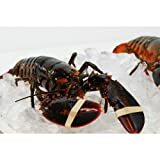 Do not remove the rubber band from lobster claws while the animal is still alive, as the animal can easily give a powerful and nasty nip using its claws. Place the lobster in the freezer, or in a container surrounded by crushed ice, for about an hour. Remove the lobster from the freezer/ice and stick a knife into the cross in its head between the eyes. Take a large pot with a lid and put in enough water so that you will be able to completely submerge the lobster. Add 1 tablespoon of salt to the water for every 2 pints (1 liter) of water. Bring the water to a fierce boil, and then add the lobster and cover. The cooking time should be 12 minutes for 1 pound (450 grams) lobster. Add an additional minute of cooking time for every 4 ounces (110 grams) of weight over 1 pound (450 grams). When the lobster is fully cooked it should turn a dark red color. You can also test by pulling at an antenna - it should come out easily if the lobster is fully cooked. Do not over cook, as the meat will then become tough in this case. Remove the lobster from the boiling water (be careful, the water will be very hot, and hot water will run off the lobster) using tongs. You will also need to pierce the head to allow water to drain out. You are now ready to eat your lobster! You can eat the meat in the lobster tail and claws, as well as any meat found in the body or legs that you can recover. 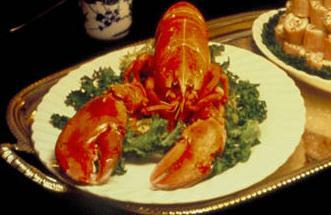 While not to everyone's taste, some people also enjoy eating the lobster tomalley (the green material found in the lobster's body), although there have been occasions when it has been warned against. If your lobster contains roe, you can eat if you wish, or you can set it aside fpr ;ater. Lobster roe can be used as a spread, mixed with butter and a little crushed shell to make lobster butter. You should not eat the shell, the sac behind the eyes, or the black vein running down the tail. You can, if you wish, retain the water used to boil the lobster in, and use this to make a base for soup. You can, if you wish, retain the lobster shells to make a stock. You can store the shells in the freezer, until you use them. These are our top seller! This is the best way to experience Maine. Everyone LOVES these lobsters! Have live Maine lobster shipped overnight to your door. If you buy online today, you are able to schedule a home delivery in advance on the checkout page. All of our lobsters are fresh, wild caught, and antibiotic free. Check out our humane lobster handling practices to learn more about how we can deliver the healthiest Maine lobster to your door. Our largest lobsters. Bring your best appetite!